A multi-agency Air Quality Cell (AQC) was first established in England in 2009 following the Buncefield Oil Storage Depot incident. A review of this event identified the need to rapidly co-ordinate the acquisition, analysis and interpretation of air quality data in major incidents. Arrangements have been made in England to bring together experts from the Environment Agency (EA), Public Health England (PHE) and the UK Meteorological Office on a 24/7, 365 days and year basis to form an AQC for any major incident threatening significant air quality impacts. The AQC will assess the potential impacts of a major incident and if necessary will deploy one or more of the four field monitoring teams equipped with portable monitoring and sampling instruments or one of two mobile laboratories. The field monitoring capability includes the use of Gasmet FTIR analyzers which provide the teams with the ability to measure multiple gases simultaneously with one instrument and to identify and measure almost any gas. The analyzers were supplied by Gasmet’s UK representative Quantitech, which also provides ongoing training and service. On the night of 21 July 2014, a large fire broke out at a Recycling facility in Swindon. Initial reports from Wiltshire Fire and Rescue Service (WFRS) at the early stage of the incident indicated that hundreds of tonnes of waste was held on site and that there were no houses nearby. As part of the initial risk assessment, PHE chemical on-call staff began gathering information and subsequently identified (using GIS maps) that the immediate area (within 250m) of the incident was mainly industrial and commercial use, with the nearest residential properties being approximately 400m away from the incident. Users of the industrial and commercial units in the immediate vicinity of the fire were evacuated and public health messages were communicated to residents providing basic advice to shelter in order to minimise exposure to the smoke plume. At this early stage, a local tactical command structure had not been established and there was no information on the expected duration of the fire. The EA and PHE were notified of the incident and discussed whether or not an AQC was required. AQC arrangements provide a mechanism to allow partner agencies to agree a common interpretation of the air pollution levels in the vicinity of major incidents; this is usually provided from a combination of air quality monitoring, modelling and expert judgement which is based on experience of previous comparable incidents. The decision to convene an AQC is made jointly by the EA and PHE and will only be activated where: (a) there are potentially significant public health issues; (b) a suitable command and control structure is in place; and (c) the duration of incident is likely to be more than 8 hours. The AQC is chaired by the EA and the core membership includes scientists from PHE and the UK Meteorological Office. Where appropriate, local authorities, the Food Standards Agency and the Health and Safety Laboratory may be invited to participate. Once established, an AQC typically operates for up to 3 days or until the acute phase of the incident is over, whichever is the shorter. The AQC partners, in discussion with any multiagency partners decide when to stand down, at which point the incident is usually handed over to the multiagency recovery group led by the relevant local authority. If equipment is deployed, the AQC (usually the EA and PHE) decides on the monitoring locations, taking into account meteorological conditions and the location of nearby human receptors. 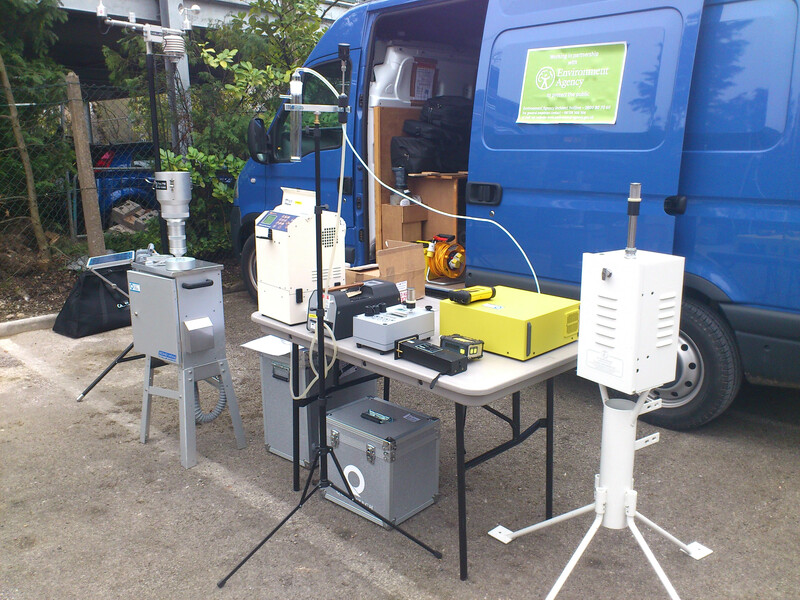 The field monitoring teams carry a range of equipment including a particulate matter monitor and a Gasmet FTIR analyzer to measure a variety of volatile air pollutants. Dependent on the nature and profile of the fire, a mobile laboratory can be deployed to provide more detailed air quality data than the portable equipment, as was the case for this incident. The Gasmet FTIR analyzers measure ambient gases, so non-heated versions (DX4030 or DX4040) are employed by the AQC and by other hazardous incident investigation teams from around the world. Sample gas is drawn into the FTIR analyzer with a built-in pump through a handheld particle filter and Tycon tubing. The analyzer runs continuously, measuring time-weighted averages of user definable length from one second to five minutes. Capable of sub-ppm detection limits without using sorbent traps for sample pre-concentration, the Gasmet FTIR analyzers provide fast response times, which is essential for ‘time-urgent’ incident investigations. Zero calibration with clean air or nitrogen once a day is the only calibration required, so carrier gases, special test gases and other consumables are not needed. The Gasmet analyzer is often used in a table-top configuration, but it is also supplied with a Teflon coated backpack, so that the user can move around looking for ‘hot-spots.’ With the standard gas library, the Gasmet DX4040 is capable of detecting 25 different gases simultaneously. However, this can be enhanced with Calcmet Pro software, which gives the user access to a reference library of over 250 gases, and 50 gas measurement capability, which is especially useful in situations where unknown gases are encountered. Initially it was decided that, on the basis of the observations from WFRS and on-site EA field officers, the criteria necessary for establishing an AQC had not been met but that the situation should be kept under regular review. As the situation developed, it became apparent there was the potential for an extended burn time with possible impacts on the environment and public health. A multiagency tactical coordination group (TCG) chaired by the police was therefore set up to coordinate the multiagency response. The EA and PHE representatives agreed to convene an AQC, with Swindon Borough Council (SBC) being invited at the early stages. Suitable monitoring locations were identified and air quality monitoring teams and equipment were deployed to the jointly agreed locations. The Met Office contributed air dispersion models to inform the locations of the monitoring points. As is often the case with extended incidents, it was necessary to relocate the monitoring equipment as a result of changes in wind direction and plume behaviour. Due to the protracted nature of this incident, SBC undertook its own particulate monitoring using three particulate matter monitors. This data was interpreted by PHE, and fed back to the Council and the tactical coordination group. This monitoring data was useful to supplement the AQC monitoring data and provide public reassurance once the AQC had stood down. The AQC reviewed the initial air quality monitoring data captured by the monitors and advised the TCG that, although there were brief spikes in particulate matter concentrations (PM10 and PM2.5), the 24 hour averages were below the national air quality standards and were unlikely to significantly impact on public health. However, as substances present in smoke can irritate the lining of the air passages, skin and eyes even when below national air quality standards, the TCG was advised that public health messages should remain in place for nearby residents. 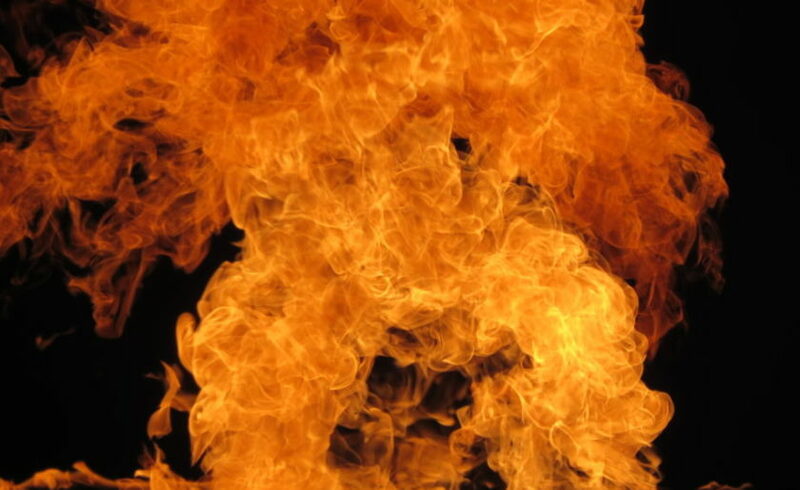 AQCs are a national resource for the early, acute stage of a fire. They are not a mechanism for providing monitoring during an extended incident or into the recovery phase. In this case, the results continued to show the same pattern of transient elevated spikes with levels consistently below the national air quality standards, for that reason a decision was made to stand down the AQC. As it appeared likely that the fire and resultant smoke could continue for a number of weeks, SBC made the decision to continue monitoring for particulate matter for public health reassurance purposes. To facilitate this, SBC obtained three air quality monitoring stations. It was agreed that PHE would continue to interpret the data provided by SBC and that the results would be reported daily to the TCG along with any recommendations for necessary updates to the public health messages. Within a few days of being on-site, it became apparent that the Fire Services were unable to make good progress and actively fight the fire due to the large volume and height of the compacted waste (approximately 10 m high in places) and a lack of physical space for the fire fighters to work in, break down the piles and separate the unaffected waste. In order for fire breaks to be established and active fire fighting to take place, it was necessary for 3000 tonnes of uncombusted waste to be removed from the site. A strategic coordination group (SCG) was activated to assist in finding alternative locations for the waste and to plan how the waste would be removed if the site operator did not comply within a given deadline. Options considered included the removal of a quantity of waste to appropriate waste sites nearby, and placing some of the waste on a disused park and ride site. PHE was represented in the scientific technical advice cell which was established to support the SCG. In this incident the site operator did not remove the waste from the site by the specified deadline, so the EA used its regulatory powers to implement the clean-up operation nearly a month after the fire started. The waste was to be checked and dampened down as a precaution prior to leaving the site and being transported to the agreed landfill site for disposal. Under normal circumstances an AQC would not be redeployed to the same site during a single incident. However, following discussions between PHE and the EA, it was agreed that due to the changes in the firefighting regime proposed, a second AQC would be needed to assess the impacts of active firefighting on the plume and subsequent impact on public health. The monitoring results indicated that, even when active firefighting commenced, the plume showed similar characteristics to that recorded during the first AQC period. Occasional peaks in particulate matter concentrations were noted, correlating with active firefighting at the site. The public health advice remained that people impacted by the plume should shelter and minimise their time outdoors. This incident generated national media and public concern, so public engagement was a critical element of the incident management process at the acute and recovery phases. Multiagency communication of public health messages were coordinated by the SCG and delivered by SBC to nearby businesses, residents and schools. As there was already a high degree of anxiety and concern from members of the local community, before the start of the active firefighting phase, local residents and businesses were informed to expect an increase in the amount of smoke from the fire and active firefighting was to be undertaken during hours when meteorological conditions would allow dispersal to minimise the impact on the community. The community was informed that active firefighting was expected to continue for several weeks and during that time period, reassuringly from a public health point of view, the number of complaints received was relatively small. There were no associated notifications to the NHS or PHE of any increase in the numbers of calls to NHS 111, visits to doctors or hospitals. In conclusion, this was the first occasion where an AQC was activated and monitoring equipment deployed twice during the same incident location. Although there was some political will for a second stage of monitoring, it should be stressed that the decision to re-establish an AQC was based solely on the need to assess the impact on public health of the changes in the firefighting regime. The monitoring data and risk assessments highlighted that the Swindon fire was unlikely to have had an impact on the long-term health of the local community.